Did Native American Activist Nathan Phillips Misrepresent His Military History? 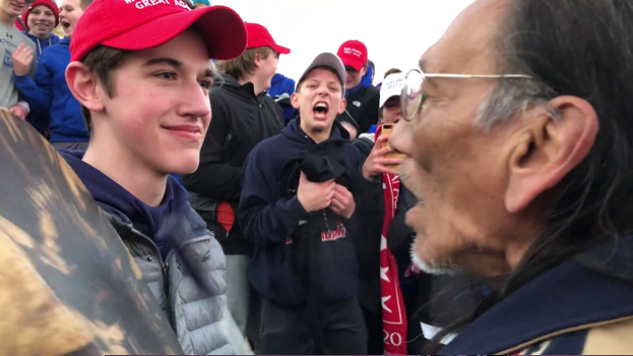 Following the weekend’s controversy regarding a standoff between MAGA hat-clad high schooler Nick Sandmann and Native elder Nathan Phillips, many were quick to defend the indigenous activist by citing his military past. Now, a closer look at Phillips’ past is revealing that he’s not the Vietnam veteran we originally thought. The question now is this: did Phillips actually lie? Well, it’s unclear. While it’s true that Phillips was represented across multiple news outlets as being a Vietnam veteran, there’s no accounts that initially trace that label back to Phillips directly. Phillips was originally quoted referring to himself as a “Vietnam-times” veteran, explaining to reporters that he understood the dynamics of “mob mentality” due to his service as a Marine. Much of the miscommunication rests on news outlets. CNN has since corrected their misquoted transcription that may have originated the confusion. The Washington Post and the New York Times have also since updated their reports. The organization representing Phillips, the Lakota People’s Law Project, has also faced scrutiny for describing him as a Vietnam veteran in a news release. Daniel Paul Nelson, a leader of the organization, said in an interview Tuesday that his group made the error in carelessly trusting previous news reports and that Phillips never informed them of his service in Vietnam. In a later video posted to Facebook, however, Phillips can be heard calling himself a “Vietnam vet” (around the 9:35 mark.) Was this lack of qualifier an instance of intentional lying or merely an isolated misstep? Who’s at fault? The reality is that Phillips served from June 1972 to May 1976 in the Marine Corps Reserve, spent much of his enlistment in California and was never deployed. The reality is also that many right-wing news outlets are already using this misrepresentation as an opportunity to invalidate what occurred over the weekend on the steps of the Lincoln Memorial. What’s important to keep in mind is that it’s not Phillips’ supposed status as a veteran that makes this incident any more or less awful. It’s not his supposed status as a veteran that makes him any more or less valuable and worthy of respect. It’s not, and never should have been, the headline buzzword used to calculate his merit for support. It is his status first, foremost, and ultimately as a human being that renders him worthy of respect.